Own a little piece of the sun! Featured on "Holmes Makes It Right ... 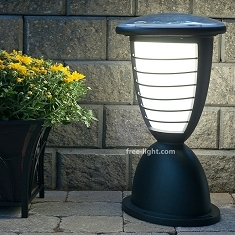 If the Shoe Fits and Mikes Ultimate Garage episodes" The ECLIPSE is the brightest solar garden/deck/pathway light we make and is the perfect solution where you want one powerful solar light to thoroughly brighten a specific area like a dock, gazebo, stairs, or patio. The ECLIPSE is a constant brightness design so it will illuminate the area with the same brightness for all 6 hours. No glare from the ECLIPSE. Lights up to 60' diameter. Read the reviews and order yours today!